petition: Morgan the Suicidal Orca Just Had a Baby in Captivity — Free Them Now! Morgan the Suicidal Orca Just Had a Baby in Captivity — Free Them Now! Famous captive killer whale Morgan recently made worldwide headlines by beaching herself on a concrete slab in a possible suicide attempt. Just weeks prior to this incident, video showed Morgan thrashing in frustration and banging her head repeatedly against the metal gate of her tank. Now she's had a baby and they're both going to suffer greatly if we don't free them. Sign the petition to ask Loro Parque to do the right thing and release their captive orcas! In the wild, female orcas can mate with whoever they like and when they have matured enough to breed safely. In captivity, that's not so. Either the park artificially inseminated her, or one of two older male orcas impregnated her. But one thing is sure: She was too you to breed safely. Rather than caring about Morgan's health and safety, the park chose to lock her in a tank with a male orca who sexually pressures her. Now that she's had a baby, the reality is that her time in captivity may have stunted her ability to nurture. 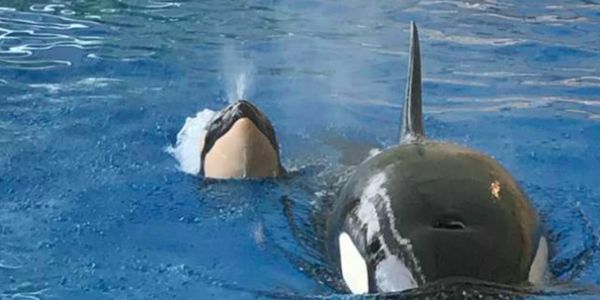 Typically orcas haves lots of chances to babysit growing up, but Morgan didn't get that chance so we don't know if she will be able to care for her baby at all. Not to mention, Morgan is already the target of bullying by her tank mates. Her body is covered in hundreds of puncture and bite wounds from other orcas who continually harass and attack her. Now there is a baby who may suffer the same fate! Morgan and her baby desperately need voices from around the world to stand up for her and demand her freedom and the freedom of her baby and the other orcas immediately. Experts believe they have found Morgan's family in the wild, which means she and her new baby could easily join them!